With Valentine's Day fast on the approach, the scramble to find something unique and a little bit different has begun. I say "unique and different"... and this product now up for grabs on Fred Flare's website certainly fits that criteria. 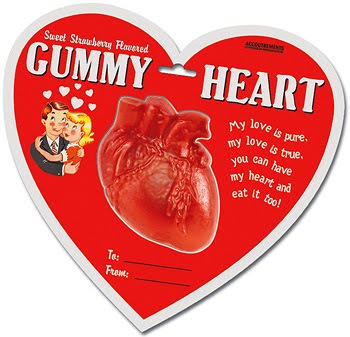 I give you the gummy heart. Am I alone in finding this sickly candy "treat" a bit off? It's literally a chewy strawberry heart...not of the cute traditional Valentine shaped variety but the anatomically correct type of heart.